OTTAWA, Ontario (AP) — Patrick Kane and the Chicago Blackhawks spoiled the Ottawa Senators‘ home opener with a big finish. 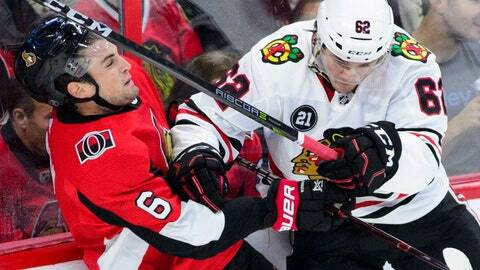 Kane scored 38 seconds into overtime to give Chicago a 4-3 victory Thursday night. Alex DeBrincat, Jonathan Toews and Brent Seabrook also scored, and Cam Ward stopped 22 shots. Seabrook tied it midway through the third, with Kane finding the defenseman alone in front for a one-timer. The teams combined for five goals in the first period. Chicago opened the scoring when DeBrincat used Thomas Chabot as a screen before firing a shot past Anderson. Ottawa tied it when Smith’s shot deflected off Duncan Keith. The goal was Smith’s first since Feb. 21, also against Chicago. The Hawks regained the lead when Toews came down the wing and fired a shot off Anderson’s shoulder. The Senators tied it in Lajoie’s one-timer, and White made it 3-2 on a power play. NOTES: Ottawa LW Brady Tkachuk is day-to-day with a mild groin sprain. D Ben Harpur was a healthy scratch. … Chicago recalled G Collin Delia after Anton Forsberg was injured during the morning skate. Blackhawks: At St. Louis on Saturday night. Senators: At Toronto on Saturday night.